The Conservative Party seems willing to accept some haemorrhage of support to UKIP, David Cameron can appeal to more socially liberal voters with an appetite for neoliberal economic policies that would inevitably follow. The new “progressive” Tory party, remains opposed to all but the lightest fiscal regulation, and don’t want to see any cap at all on corporate bonuses. 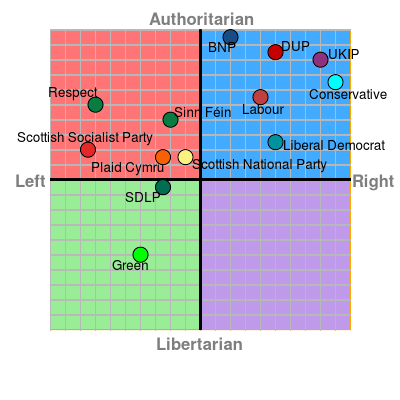 The Lib Dems are now widely viewed as a party of few fixed principles. Labour despite hopes from the left, remains largely attached to the New Labour agenda that took the party to the centre ground. This may be the first election in which UKIP is seen not as a protest party, but as a deeply conservative one that largely endorses the neoliberal agenda. Nigel Farage’s recent shift from unequivocal support for health care free at the point of use underlines this reality. Traditional Labour voters will largely stick to their old electoral habits, even though the Greens bear a far closer resemblance to the party they supported in the pre–Blairite days. An increased Green vote will likely come from former Lib Dem voters.